There’s no ‘typical’ path through science. Gerald Young is the perfect example. Gerald Young likes to think about thinking. 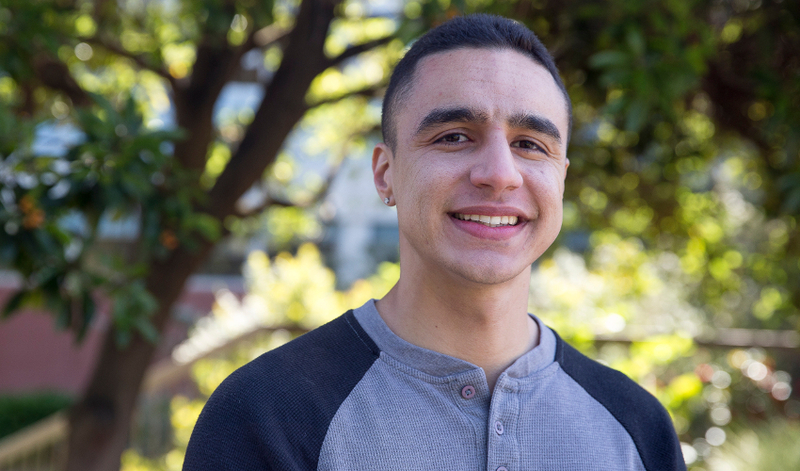 Specifically, the San Francisco State graduate student has focused his research on rumination, the process of dwelling on the source of problems in one’s life. Yet he’s managed to keep looking forward despite a rocky road to a Ph.D. program. Students in the sciences are often confronted with a very linear scenario of how they should advance in academia. Four years as an undergraduate, six years getting your Ph.D., three years in postdoctoral research, seven years to tenure, and then you’ve got it made. In reality, there’s no typical path. Young is a perfect example. After two years in community college, he transferred to California State University, East Bay as a psychology major, hoping to eventually become a California highway patrolman. He ended up doing data entry as a research assistant for a professor who was impressed by his work ethic and told Young he’d be a good fit for a Ph.D. program. He was flummoxed. “My father has a bachelor’s degree but no one else in my family went to college,” he said. But after some convincing, he decided to pursue a career in research. Bolstered by his professor’s prior encouragement, he applied to 14 Ph.D. programs… and was rejected from all of them. “I was naïve,” he explained. “I didn’t really understand the process,” especially the important role of research experience in making candidates competitive. That chance came when he was accepted into the masters of psychology program at SF State, where he’s studied under Professor of Psychology David Matsumoto, an expert on facial expressions and emotions and non-verbal communication such as gestures. When Young applied for Ph.D. programs a third time, his uncertainty was gone. He begins a Ph.D. program at the University of California, Berkeley in the fall. While at SF State, he’s dug deeper into the science behind rumination. Previous studies have shown that it’s commonly experienced by those with depression. “People with depression focus on negative information about themselves. It just becomes worse and worse over time,” Young said. Psychologists have tended to study rumination in white Americans, although emerging evidence indicates that the way a person ruminates might depend on their cultural heritage. Young’s thesis work at SF State looked at how Asian Americans experience rumination differently from European Americans. Next, he plans to further expand the scope of his research. “There’s no literature on Hispanics or African Americans,” Young said. Even while he finishes up his thesis, Young isn’t sitting still. He continues to volunteer for the same Stanford research lab, and he works as an evaluator for the SF BUILD program, finding ways to quantify the program’s effectiveness in meeting its goal of helping underrepresented students advance in science.